This is 20 different patterns/colors. Each file is 12"x 12" 300 dpi JPG file, so the images will be high quality and crisp! 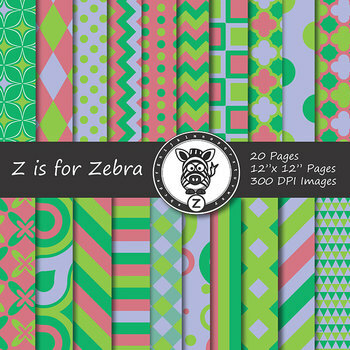 This item is a paid digital download from the Teachers Pay Teachers store ZisforZebra. This product is licensed for use a non-transferable user license, for personal, small scale commercial, and educational use. Commercial use ok. See Terms in the zip file for more information. ● Use these graphics for use in a classroom, for personal or for commercial use. ● Use these graphics on your website. ● Transfer, distribute, redistribute or sub-license, lend, share sell/resell the product "as is." If you sell these images they must be part of new file and cannot be the primary focus of the file. ● Upload these images/files for distribution (for free or pay) as is, please use these files in your own products. If you use this product you must provide credit and a link from your product back to my store: "Graphic by Brian Johnson / ZisforZebra - http://www.teacherspayteachers.com/Store/Zisforzebra"
Enjoy & Please leave feedback if you find this useful! If you like this product, please take a minute to "LIKE" it and "PIN" it!